One of NUU Mobile's first attempts at a rugged smartphone and also one of its earliest 2019 releases, the NUU Mobile R1 is a gritty budget-class Android in terms of technical pros and cons. Among its weakest points are its ancient-sounding (as of this Phonerated review) 2-megapixel-only front-facing camera and run-of-the-mill 8-megapixel primary rear-facing cam . The above-mentioned cons seem to be necessary trade-offs to keep the R1's price point within entry-level territory, though, since NUU houses its specs inside a toughened shell that passes both IP68 and MIL-STD-810G rugged certifications. The former makes its 0.51-inch-thick physique impervious to water and dust, while the latter rigs it with native resistance to accidental impacts as well as to temperature extremes. This low-budget prepaid contender (Check out some of its prepaid competitors here) also lists a sizable 4000mAh battery among its pros, giving it a huge advantage versus a lot of other entry-level smartphones, most of which stick to roughly 2500mAh power caps only. Its processing components include a measly MediaTek MT6739 quad-core processor clocked at 1.3GHz and an equally-basic 2GB RAM. When it comes to storage, while its 16GB native memory is respectable, coming from a budget-class rugged Android, its support for no more than 32GB of external memory sounds a tad problematic, considering that many of its rivals in this category support 64GB and even 128GB external memory cards. Joining the aforementioned pros and cons are a standard 4G LTE network adapter, two micro SIM card slots, and a passable (for a phone within its price group) 5-inch 1280 x 720 HD display hardened by a damage-resistant Gorilla Glass finish . Mimicking several other rugged models, it rocks a plain Black exterior, with the Android 8.1 Oreo operating system tying everything together. 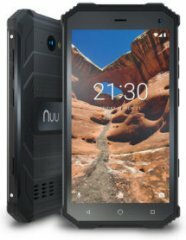 All said, NUU's R1 is, overall, an entry-level smartphone, but its rugged housing and robust battery pack certainly makes it more ready for the outdoors than most other models in its category.